Since I have some very sweet breakfast treats planned to share with you over the next several days. And because I wanted to share several different types of breakfast recipes with you all. 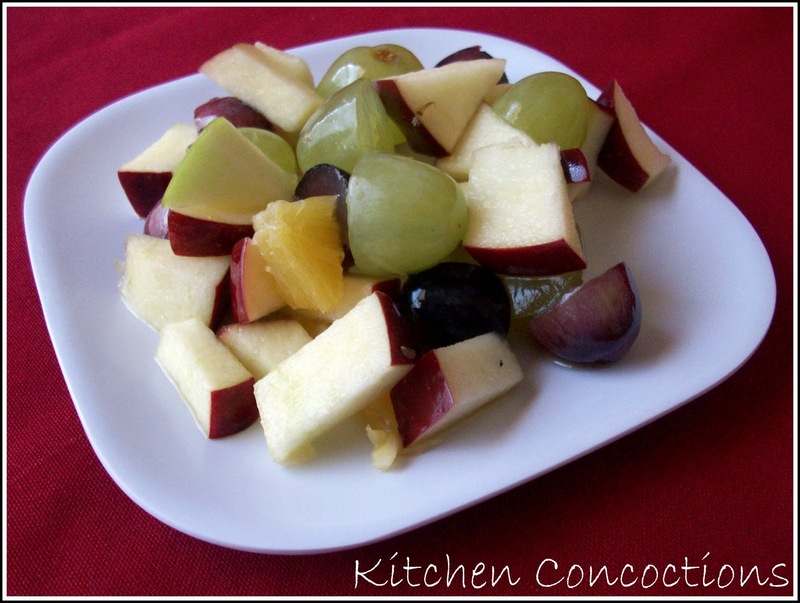 I have a simple fruit salad for you today (man those were some poorly written sentences). While this may be a simple salad I thought it is great for breakfast. Sometimes simple is necessary, especially on a day when other things are priority. This salad can be made in advance and refrigerated (it holds we’ll because of the lemon and orange juice) and is a great salad for this time of year because it uses winter fruit. I loved this salad with breakfast, lunch and as a healthy midnight snack.! Place all fruit in a large bowl. Pour lemon juice over fruit and toss to coat. Set aside. In a small sauce pan, combine orange juice and sugar. Bring to a boil; cook until liquid is reduced to about 1/2 a cup. Pour orange juice reduction over fruit and toss to coat. Refrigerate until ready to serve.